of Scientology International (“Scientology”) seeks to enforce against Armstrong in this case and its consolidated cases to determine the contract’s unconscionability; to stay Scientology’s motion to reinstate jail sentences against him and to issue warrants for his arrest; and to stay any other actions by Scientology against him in this Court until after such an evidentiary hearing has been held and this Court has made such a determination. 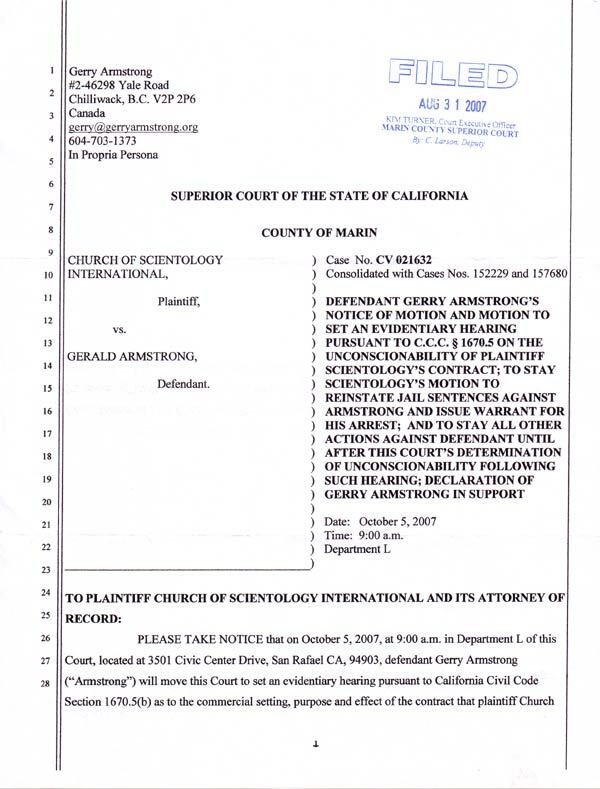 Armstrong’s motion is made upon the grounds that the Marin Superior Court has already rendered a determination of unconscionability as to two of the contract’s clauses; that Scientology has voluntarily dismissed its appeal of that determination; that Armstrong has claimed and is claiming to this Court that certain other clauses of Scientology’s contract are unconscionable; and that Armstrong is entitled to such an evidentiary hearing as a matter of law. This motion is based upon this notice, the memorandum of points and authorities, the declaration of Gerry Armstrong in support of opposition to motion to reinstate sentences and issue warrant, and in support of motion to set evidentiary hearing pursuant to C.C.C. § 1670.5 (“GA Dec”) and the exhibits thereto (“GA Dec, Ex. __”) all served and filed herewith, the record in this consolidated case, the record on appeal in this case, and such other matters as may properly be brought before the Court. MR. ARMSTRONG RECEIVED A BENEFIT UNDER THE SETTLEMENT AGREEMENT OF $800,000. AND I THINK IT WOULD BE UNCONSCIONABLE TO PUNISH HIM BEYOND WHAT THE BENEFIT WAS THAT WAS CONFERRED TO HIM. Mr. Armstrong received a benefit under the settlement agreement of $800,000. It would be unconscionable to punish him beyond what the benefit was that was conferred to him. Armstrong was previously sanctioned in the sum of $300,000. GA Dec, 2:21-3-5, Ex. C.
Scientology appealed from this judgment, filed an opening brief, and Armstrong filed a respondent’s brief. (GA Dec. 3:25-4:6, Ex. F) He argued that Scientology’s remedy was to avail itself of the remedy provided by C.C.C. § 1670.5 and demonstrate, through the presentation of evidence as to the contract’s commercial setting, purpose, and effect that the contractual clause this Court adjudged unconscionable was actually conscionable. As a party, Armstrong also had, and has, a right to be afforded a reasonable opportunity to present evidence as to the contract’s commercial setting, purpose, and effect, and he requested such opportunity, and requests it now. any unconscionable clause as to avoid any unconscionable result. The Court: Well, liquidated damages have to be reasonable. I think it's unreasonable to go beyond the amount that was paid to Mr. Armstrong. Exs.16:351.
of Scientology’s unconscionable liquidated damages clause as to avoid the unconscionable result of Armstrong being assessed monetary damages for millions or trillions of dollars or more, lawsuit after lawsuit, for the rest of his life. that its “contract,” by which it had hounded Armstrong around the world, bankrupted him and threatened him for 18 years, is unconscionable. Indeed, Scientology should be very concerned, because Judge Duryee’s judgment not only ends Scientology’s drive for judicial enforcement, but exposes all of what Scientology and its beneficiaries, such as attorney Wilson, have done to enforce the unconscionable “contract” or otherwise unconscionably shudder Armstrong into silence. But Scientology is not going about undoing Judge Duryee’s judgment that its “contract” is unconscionable in the way prescribed by law. that it is to be afforded by CCC §1670.5. Scientology must present evidence of the circumstances at the time the “contract” was made that demonstrate that its unconscionable clauses were not then unconscionable. Armstrong must be afforded such an evidentiary hearing to demonstrate that the unconscionable clauses that Judge Duryee found to be unconscionable were indeed unconscionable at the time the “contract” was made. unconscionability of the “contract” at the time it was made, except as an effect of the unconscionable “contract.” Obviously, to assist the Court in determining the effect of Scientology’s unconscionable contract, there exists now 18 years of evidence of that effect, which includes Judge Thomas’ actions and orders enforcing that unconscionable “contract.” Thus a later judgment of unconscionability as to the “contract” must be an automatic exception to the application of collateral estoppel and res judicata to Judge Thomas’ judgment. Scientology, citing Hong v. Somerset, 161 Cal. App. 3d 111 (1984) admits as much. Scientology is attempting to improperly avoid submitting to an evidentiary hearing on the circumstances at the time the “contract” was made, which is Scientology’s“remedy” provided by law, by getting this Court to overrule the Marin Court’s judgment of unconscionability. This Court cannot overrule the judgment of unconscionability, however, because this Court is not the trier of fact as to the circumstances at the time the“contract” was made, concerning which no evidence has yet been adduced because there has been no hearing. signing Scientology’s unconscionable “contract” Armstrong has considered that“contract” unconscionable. From the day in 1992 when Scientology served on him its first lawsuit to enforce its unconscionable “contract” Armstrong has sought an evidentiary hearing, indeed a trial, on the circumstances at the time the “contract” was made in order to demonstrate its unconscionability. From the days in 1995 when Judge Thomas made his summary adjudication rulings denying Armstrong a trial on the circumstances at the time the unconscionable “contract was made” Armstrong has protested that the denial of the trial that he sought was improper. From the day that this Court improperly dismissed Armstrong’s appeal from Judge Thomas’ denial of the trial Armstrong sought Armstrong has protested that improper dismissal. Judge Duryee’s unconscionability judgment has proven Armstrong right, and CCC §1670.5 now gives him, and Scientology, the evidentiary hearing, or trial, that he was previously improperly denied. Finally, because of your voluntary dismissal of your appeal of Judge Duryee’s judgment I would like to work out with you a format and timetable for a hearing or hearings in the Marin Court to resolve certain issues that have been ripened by that dismissal. The legal authority and guidelines for the immediate hearing I seek are provided by C.C.C.§1670.5, which, as you know, I quote in my respondent’s brief and argue is the governing law in the case. time for you to appeal. Your client actually appealed the unconscionability judgment prematurely in order to avoid the statutory evidentiary hearing. You and your client then chose to dismiss the appeal, hoping again to perhaps be able to avoid rather than avail yourselves of such a hearing. The Court of Appeal should have reached that result or remedy, as California’s Unconscionable Contract Statute is very clear, if you had not dismissed the appeal and I had prevailed. Just as your client, upon the appearance to the court that your contract is unconscionable, is to be afforded an evidentiary hearing as to the contract’s commercial setting, purpose, and effect, so am I, the other party, to be afforded such a hearing. As you know, I requested the Court of Appeal in my respondent’s brief to order an evidentiary hearing in accordance with C.C.C. §1670.5, and with your dismissal of your appeal the opportunity for the Appellate Court to order the Marin Court to afford me such a hearing is also gone. My remedy now is to go directly to the Marin Court and request the Court to set an evidentiary hearing, and I would like your client to either join in my request for a hearing, since you have to be there anyway, or to at least not oppose my request. Mr. Wilson and Mr. Greene were unable to agree on the language of the orders, Judge Duryee herself wrote the two orders, which were entered on May 20. Mr. Wilson received the two orders, but Mr. Greene did not receive either of them, however, and continued to communicate with Mr. Wilson to try to reach an agreement on the language for the two proposed orders. In fact, as late as July 8, 2004, Mr. Wilson forwarded to Mr. Greene another proposed judgment for Mr. Greene’s approval as to form. Mr. Greene only learned from Mr. Wilson about Judge Duryee’s May 20 orders on July 12, on which date Mr. Greene went to the Marin Courthouse and obtained copies of those orders. On July 15 your client, who along with its lawyers had possessed the orders for almost two months, filed its notice of appeal and its petition for writ of mandate or certiorari. Thus I have never had an opportunity to request the Marin Court to set the evidentiary hearing that I am to be afforded pursuant to C.C.C. §1670.5, and with your dismissal of your appeal I will now do so. I am sure your client wished that my right to such an evidentiary hearing had been dismissed or lost along with your appeal, but the dismissal actually makes the need for a full hearing more acute. With your voluntary dismissal, you have accepted Judge Duryee’s judgment, and you have accepted that where it conflicts with Judge Thomas’ judgment, Judge Duryee’s judgment rules. You have acknowledged that unconscionability trumps res judicata and collateral estoppel, which of course unconscionability must. You have also accepted with your voluntary dismissal of your appeal that liquidated damages in your client’s contract are punishment, which of course they are. As I already stated in my respondent’s brief in the appeal, your client argued in its opening brief, perhaps crafted by Mr. Wilson, that because the law does not permit liquidated damages to be punishment, the punishment that your client’s liquidated damages clause subjects me to cannot be punishment; otherwise the liquidated damages would be punishment, which liquidated damages cannot by law be. The trial court erred in confusing cumulative judgments exceeding $800,000 with punishment because, as a matter of law, liquidated damages are not and cannot be punishment. The trial court also had no authority to limit CSI's recovery under the liquidated damages provision by characterizing it as "unconscionable." A reasonable, enforceable liquidated damages provision is, by definition, not unconscionable. There is now a final judgment, which you have accepted, that says that the liquidated damages provision is unconscionable. Therefore the provision is, as your client says, not reasonable and not enforceable. The judgment states moreover that the monetary sanctions your client has been attempting to obtain against me, which your client and its lawyers have been calling liquidated damages, is actually punishment. Since liquidated damages may not by law, as your client also says, be punishment, the“liquidated damages provision” is unlawful and cannot lawfully be enforced. judgment simply states that punishing me beyond $500,000 was unconscionable. I am claiming that all of the punishment your client has been calling liquidated damages, from the first dollar through the last impossibillion dollars, is unconscionable. I shall now do whatever I can to be afforded, as provided in C.C.C. §1670.5, a reasonable opportunity to present evidence as to the contract’s commercial setting, purpose, and effect to aid the Marin Court in making the determination that the contract is, as your client has attempted to enforce it, and is still obviously actively attempting to enforce it, in all ways unconscionable. There has never been a hearing on the commercial setting, purpose, and effect of the contract, and it is sorely needed in this litigation war your client, and you, are waging on me. Your client and its lawyers have gone to criminal lengths to prevent me from getting a fair hearing or trial. Yet, absent a fair, conscionable settlement, a fair hearing or trial is about the best thing I could work for to give either me or your multitudinous client peace. It will give me peace, because I’ve been fighting for a fair hearing for something over sixteen years, just to get that fair hearing. By its refusal to be fair and give me a fair hearing, of course, your client is saying, as it has always said, that it doesn’t want peace. It wants to war on me and get its satisfaction by punishing me. I am not kidding myself that I’m a lawyer, and I know that I have been blessed far beyond my severe limitations and resourcelessness in lasting against your client and its lawyer army in the legal arena this long. I know that to prosecute my claims against your client I will need a lot of help, and even to proceed with the C.C.C. §1670.5 evidentiary hearing I really will need a lawyer. I’m going to do what I can to involve lawyers in my situation and claims, and I hope that your client’s dismissal of its appeal and the effects of the dismissal, some of which effects I’ve touched on in this letter, will make my legal situation and claims much more fetching. In the meantime, you have to deal with me, so I want to tell you that I’m available should your client or you wish to discuss dismissal of your writ petition, or the setting of a C.C.C. §1670.5 hearing in the Marin Court, or even about settling this war once and for all. I have not addressed in this letter a number of issues that exist between your client and me, such as religious liberty, the constitutional guarantees for which also completely bar your client from doing what it's doing to punish me, and the obvious malicious prosecution cause of action that has matured with your voluntary dismissal of the appeal. Clearly your client and its lawyers and I have many things to discuss in order to bring an uncataclysmic end to your long war on me. For now, I would like your client to take the simple steps I have suggested in this letter, which, with your dismissal of your appeal, I believe your client and you must take. From the time (July 12, 2004) Armstrong learned of this Court’s May 20, 2004 judgment until Scientology filed its notice of appeal from the judgment (July 15, 2004) he and his attorney had only three days to request that this Court afford Armstrong the reasonable opportunity C.C.C. §1670.5 mandates that he be afforded to present evidence as to the contract’s commercial setting, purpose, and effect. On August 7, 2007, Scientology filed its motion to have this Court reinstate sentences against Armstrong and issue a warrant for arrest . Armstrong is filing an opposition to Scientology’s motion at this time, and he incorporates that opposition into this motion. Since Scientology waited over a year and a half to file its motion after remittitur issued, it really cannot complain that Armstrong waited too long to file this motion. Armstrong has a statutory right, both by this Court’s judgment now that Scientology has dismissed its appeal, and by his own claim to this Court, to an opportunity to present evidence as to the unconscionability of Scientology’s contract. Scientology has two choices: submit to an evidentiary hearing provided by C.C.C. §1670.5 on the contract’s unconscionability; or, acknowledge that the contractual clauses it seeks to enforce are unconscionable and stop all enforcement actions. Clearly, Scientology has acted to prevent Armstrong from receiving a fair hearing all these years because it knows that the contract clauses it is enforcing are unconscionable. Scientology must not be permitted to continue to deny Armstrong a fair hearing, because such denial would be unconscionable. and to stay any collection actions by Scientology or any other punishment against him until after such an evidentiary hearing has been held. Executed on August 30, 2007 at Chilliwack, B.C., Canada.